Rio Grande’s Harry Reilly speeds past Indiana East’s Nate Guenther during the first half of Wednesday night’s River States Conference Men’s Soccer Championship semifinal game at Evan E. Davis Field. Reilly scored both goals in the top-seeded RedStorm’s 2-0 win over the Red Wolves. 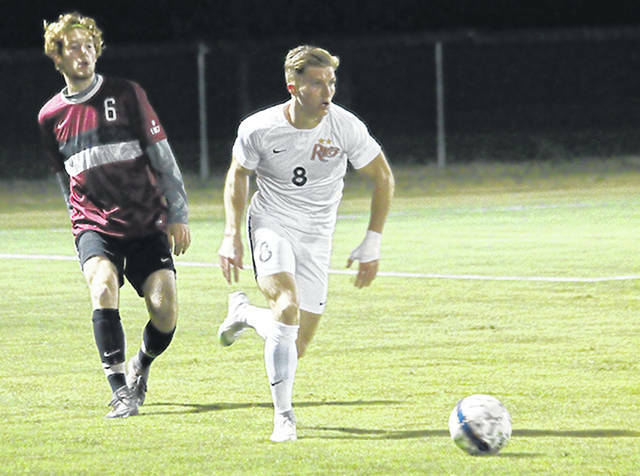 RIO GRANDE, Ohio — Harry Reilly scored goals in each half to lead the University of Rio Grande to a 2-0 triumph over Indiana University East, Wednesday night, in the semifinal round of the River States Conference Championship at chilly Evan E. Davis Field. Rio Grande, the tourney’s top seed and the top-ranked team in the latest NAIA coaches’ poll, improved to 17-0 with the victory. The RedStorm also punched their ticket to Saturday’s tournament title game against second-seeded WVU-Tech, which advanced via a forfeit win over sixth-seeded Brescia University. IU East finished 10-10 with the loss. Reilly, a senior from Coventry, England, gave Rio the only goal it would need with 9:01 left in the first half when he drilled a shot into the lower left corner of the net past IU East net-minder Gianluca Marchetti. The scoring shot came after a straightaway attempt by sophomore Callum Malanaphy (Stourbridge, England) from 25 yards out ricocheted off the backside of freshman Nicolas Cam Orellana (Santiago, Chile), allowing Reilly to gather in the ball and score the tie-breaking marker. The game’s second and final goal came with 15:14 left to play when sophomore Ewan McLauchlan (Aroch, Scotland) pushed a ball into the box, which Reilly toe-poked past Marchetti into the back of the net. Rio finished with a 23-2 edge in shots overall and an 8-2 cushion in shots on goal. Junior keeper Richard Dearle (Castle Donington, England) had two saves in the win for the RedStorm. Marchetti stopped six shots in a losing cause for the Red Wolves. Rio’s championship showdown with WVU-Tech on Saturday is set for 4 p.m. at Evan E. Davis Field.